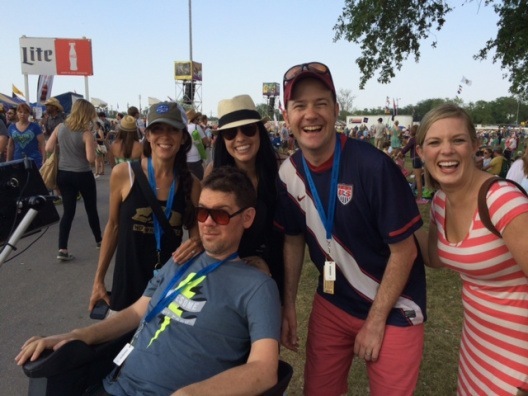 With the funds from The Gleason Initiative Foundation, we were able to bring Stephen Finger and his wife, Cara to Jazz Fest this year in New Orleans, LA! See below for his blog about the weekend. When I saw the JazzFest lineup come out a couple of months ago, my jaw dropped. Friday included Jason Isbell followed by the Avett Brothers. My two favorite bands playing back to back in New Orleans no less. However, our spring was already pretty packed. I had a work trip and college reunion. Cara had a couple of the work commitments. We were headed to the beach with the kids. After a couple of calm months in the early spring we were heading into a crazy stretch. Then a couple of days later I got an email from Lauren Bowman from Team Gleason inviting us down. Too good to be true. So I got up the nerve to ask Cara about adding another event to our schedule and luckily the thought of a quick getaway with few New Orleans meals thrown in was enough to tempt her into saying yes. So we were down there last week from Thursday to Sunday. My parents came down and looked after the kids in Columbia and we snuck away for our getaway. Maybe we don’t do these enough. A chance to take a deep breath and enjoy each other’s company. With everything going, that can get lost in the shuffle. The trip could not have been better. We got in Thursday and had two fabulous meals. We have eaten well in New Orleans before, but our dinner Thursday night at Clancy’s just seemed perfect. The food, the champagne, the atmosphere, the company. After a breakfast of beignets on Friday in the French Quarter we headed over to JazzFest. Michel Gleason texted us a list of “must eats” and it did not disappoint. After living in the Carolinas for the past 12 years, I have learned to take pork very seriously. She recommended the cochon du lait. Amazing. I mean you are at this music festival, great music, good times, and when you want a bite to eat you are blown away by the food. The cochon du lait would be a treat at any price, at any restaurant, but at JazzFest it is just that much better. Both Jason Isbell and the Avetts put on great sets. We met up with my aunt and uncle who have lived down there forever and happen to be about the two coolest people we know. Way more interesting than Cara and I will ever be. They served us a great shrimp supper after the festival and then snuck us into their daughter’s art exhibit (http://www.chillplease.com/). I mean, how cool is that? A couple more great meals and another great day at the festival and then we had to pack up and head home. From purely a getaway perspective, this was a perfect trip. Tremendous meals. Cara got to sleep in. I got to see two of my favorite bands. We got to spend a few days doing nothing but spending time together. No kids. No touristing. Just us together eating and listening to music. But for all the fun we had, still the best part of the trip (other than spending time with my wife) was getting to meet the folks from Team Gleason. We met up with them Friday afternoon during the Avett’s set. They seem like the epitome of New Orleans. Great people, who love to have fun, and with the utmost sense of community. They rolled into the festival as a pack. Blair and Lauren, the two full-time Team Gleason employees, along Steve, Michel, her brothers, their wives, their friends etc.. Talking with them, you knew you were a part of something special. We knew we were not alone. They are devoted to improving the lives of families facing the disease. Hanging out at the festival, not only do you see how everyone in the city is inspired by and has rallied around Steve, but also it seemed that half the people that walked by were old friends now helping with Team Gleason. People who, inspired by Steve, were working to support his family, and all families dealing ALS. We, as members of the ALS community, are incredibly lucky to have had them adopt our cause, and more importantly it shows how one individual can rally people to act. As my uncle was driving us home on Friday night we passed by St. Margaret’s Hospital, home of the Team Gleason House for Innovative Living. This facility is equipped to allow people with ALS, whose minds are perfect but are limited physically, to live more independently. People who can still lead productive lives in the right technological environment are able to control everything around them through their computers. Today they announced the Saints owner, Tom Benson, donated $5 million to establish an endowment to cover the facility’s operating expense. Steve says he sees no reason why every NFL city couldn’t have a similar house. If the community of people supporting the cause continues to grow, there is no reason they can’t. Getting to meet Steve was an incredible honor. One of Team Gleason’s taglines is, “Awesome ain’t easy”. It is clear that there is nothing easy about his situation, but that makes everything he does that much more awesome. He couldn’t communicate through his tablet in the sunshine. How is this possible? In talking to people living with ALS it is clear that making people’s lives easier, makes them live longer. There is nothing more essential to quality of life than the ability to communicate, but we haven’t figured out eye tracking technology that works outside? This seems like something a few grad students could figure out. These are solvable problems that Team Gleason is working to solve to improve people’s lives. But even with this limitation, it didn’t stop Steve from being incredibly gracious to Cara and me. Incredibly gracious to everyone who came up to say hi. It didn’t stop him from making jokes at his wife’s expense. On Saturday, he tweeted that he didn’t feel up for going to JazzFest but then followed it up saying “ALS is a training for wanting only what you have. As you have less, learn to want less. Find new, creative ways to explore and expand.” I know nothing in my future will be easy, but after meeting Steve I know there is no excuse for not making it awesome. Thank you to Steve and to all of Team Gleason for an incredible weekend. No White Flags!